This month our Special Ruler is the Creative Grids Half-Square 4-in-1 Triangle! This is a great tool for making half-square and quarter square triangles. Whatever your preferred method is, this is the ruler for you. It marks, cuts and trims for four different techniques. Want to see how it works - Click HERE. 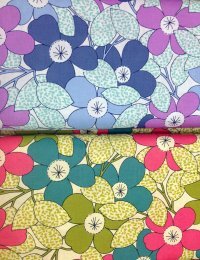 We've been busy replenishing our standard stock fabrics but do have a bolt of two to show you of new things. Sports Fans! Footballs, baseballs and basketballs have arrived. Soccer balls are due in any day now. A little of the night sky to tempt you. 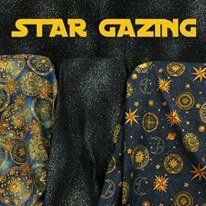 Since the days are getting shorter now, you be seeing a lot more of the stars anyway - Why not put them in a quilt?! Stitcher's Garden. I've been holding out on this one! Big plans for it! I challenge you to use either the green or blue version of this adorable fabric in a quilted item (quilt, bag, table runner...) and bring your finished project back into the Blue Hen Quilt Shop by March 1, 2017 to hang in a Viewer's Choice Show. Quilts will hang in the shop for 30 days and customers will be invited to vote on their favorites. The piece with the most votes will win a gift certificate to the Blue Hen! Are you up for the challenge? 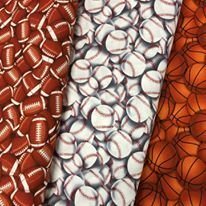 Come into the shop to pick up the rules and the challenge fabric! The WOW Bag - is it a tote or a duffel bag? Only you will know for sure! Eleanor Burns is in the house! Check out these Quilt in a Day patterns. They come highly recommended by our very own Mitzie! 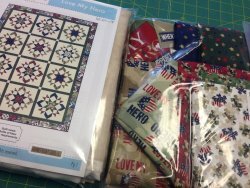 And we are stocking up on some kits for your sewing pleasure. 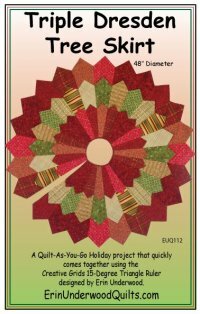 There's plenty of time to get this lovely quilt as you go Tree Skirt finished before the holidays! Back by popular demand! 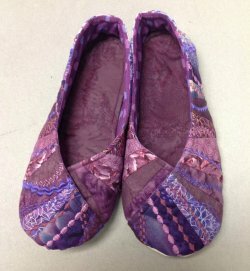 Come make a pair of one-of-a-kind slippers for yourself or for someone special! The are Yo-Yos - too cute! Three-dimensional trees! 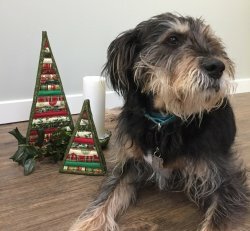 Made with 2-1/2" strips and some batting - Preston the Dog approves! If you missed your chance to get our Delaware Delight Row pattern or kit this summer, you can still have one of your very own! Row by Row 2016 patterns and kits are now available for purchase. As the holidays are approaching, let us help you get exactly what you want this year. 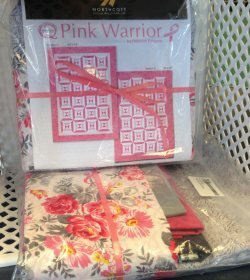 The Blue Hen Quilt Shop is offering to keep your "Wish List" on your account for those friends and family members who need a little hint now and again when buying you the perfect holiday surprise! Come in and tell us what you want - we will be sure to pass it on! 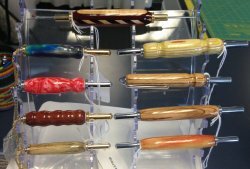 Perhaps one of these stunning seam rippers is something you are interested in! 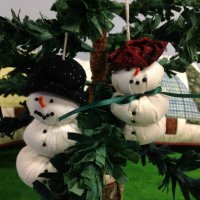 Handmade by a local artist - many styles to choose from! We currently have a Grab-and-Go box filled with 1-yard cuts of fabric - Just $10 each. These are left-over from Erin's vending excursions this fall - no place to put them on the shelves here so maybe they will fit better in your sewing room. And here's a sneak peak at our new Block of the Month - Hexology! It starts in January - Come check it out! Erin still needs to put the binding on and we plan to offer a few colorways. 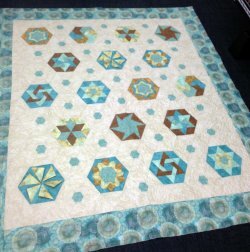 It's all about the Hexagon - all pieced with the Creative Grids 60-degree Triangle Ruler. We will be closed Wednesday, November 23rd - Friday, November 25th for the Thanksgiving holiday. We will be back on Small Business Saturday, Nov. 26! Come out and support your new-found favorite small shop!